The first of July, 2016, is the centenary of one of the bloodiest battles of the First World War: the Somme. A hundred years ago, many thousands of British and French soldiers, some still in their teens or barely out of them, waited in the darkness of early morning for the signal that would launch them against the mud, barbed wire and machine-guns of the German front-line. Some of them may have hoped that they would meet little resistance: mines had been laid, ready to explode just before the advance began, and an artillery bombardment of unusual ferocity was supposed to soften German resistance, cutting the wire and allowing the attackers to move quickly and easily into enemy territory. But by that stage of the war it was well-known that artillery and mines could not batter the enemy into submission. They could kill, maim and deafen, filling the sky and air with the scream of shells and the thunder and stink of high explosive, but they couldn’t dislodge a resolute enemy from every trench and dugout. When the artillery fell silent, the whistles began blowing and the attackers emerged from cover to find the defenders ready and waiting. It was like walking into Hell: waves of advancing men were greeted with a storm of bullets. When flying metal meets flesh and bone, the results are horrific. Men lost limbs or were decapitated in an instant. The earth was strewn with entrails and soaked with blood. 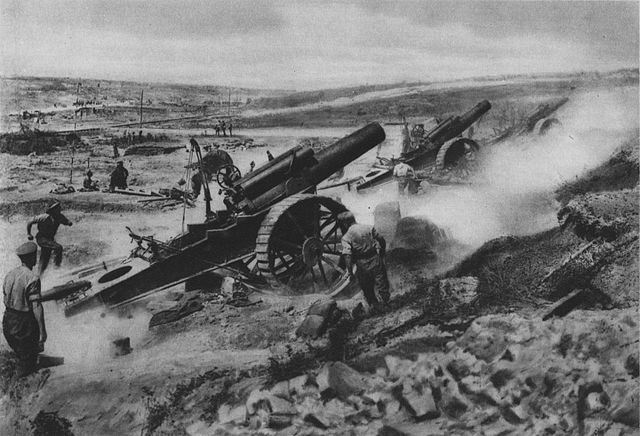 The scream of artillery shells was replaced by the screams of men, dying or seriously wounded. The British army alone lost more than twenty thousand men on that first day, and many thousands more were wounded. In many cases, the wounded may have envied the dead: some of them would be crippled for life. Others were physically unscathed, but suffered other kinds of wounds from what they had experienced in the battle: the horrific sights, sounds and – not always remembered – smells of war. And that was simply the first day of a battle would last for nearly six months. Back home, families waited anxiously for news of the fathers and sons, uncles and nephews, who were fighting. Some would be praying that their loved ones would suffer a “Blighty One” – a wound that didn’t threaten a soldier’s life, but did bring him out of the front-line and back home to a hospital in Blighty, as Britain was called in military slang. But other families would have a strange and sombre experience: they would read letters from the dead, written on the eve of the battle by men who knew that they might never be coming back. The letters would be found on their bodies and sent back to their families. Down the years since the war, the Imperial War Museum in London has collected thousands of these letters, donated by families that are now scattered all over the world. As part of the commemorations of the Somme, these letters are going on display at the museum and in virtual exhibitions on-line. The words of the soldiers are deeply moving and so, in many cases, is the condition of the letters: they’re creased and fragile, almost falling apart from countless readings and re-readings. Some are stained with mud or carrying a note from a chaplain or a commanding officer that said the dead man had died quickly and without suffering. In many cases, that wouldn’t be true. It would be a kindly lie meant to shield the family from further pain. And the dead soldiers often wrote in light-hearted tones, joking about what they faced and asking their families not to worry too much or grieve too deeply if the worst happened. And when those who survived the Somme and the rest of the war came home, they too often told kindly lies or kept silent about what they had experienced. The horrors of the war were too great and many soldiers felt that it was impossible for civilians to understand them. A hundred years on, we know that they were right. Britain has fought many more wars and lost many more men. Technology has advanced and ever more detailed images of the battle-field can be captured these days. But only those who have fought and faced the bullets know what it’s really like. We on the outside can only catch a glimpse. No veterans of the First World War are alive today, but their voices still speak to us in their letters, written on the eve of a battle that thousands of them would not survive.